With kids always on the run, it can be hard to remember if they fell or were having pain or trouble with their feet. Our office sees pediatric patients on a regular basis. Don't hesitate to reach out if you think your child may be having trouble with one of the conditions below. If someone asked you who or what in your life is your biggest priority, as parents our answer will always be our children. We put their wellbeing before our own in most cases. When it comes to children’s feet, our office sees a lot of them! Until children have reached skeletal maturity (sometime in their teens), they cannot be viewed as just being tiny humans. They way that their bodies work is different and still changing as they grow. When it comes to injuries, they are more prone to hurt parts of their body that we as adults are not even able to injure anymore. Looking at the specific conditions we most often see kids suffering from at our office, we can break these down into two categories primarily – dermatological (skin/nail related) and musculoskeletal (both traumatic and overuse). Our kids are busier than ever with sports and extracurricular activities. When our kids are very young, they may not even complain that their feet hurt, but we have infer that something is wrong based more on their behavior…just another tough part about parenting! There are 3 primary dermatological (or skin-related) conditions that we see in our pediatric population and those include ingrown toenails, athlete’s foot and warts. Ingrown toenails: These can happen as a result of injury or incorrect shoe size that places pressure along the corner of the nail. It can also be due to a genetic predisposition to grow a very curved nail. Whichever the cause, ingrown nails can further be broken down into either infected or non-infected. Unfortunately, we see more of the former. An ingrown nail that is painful but does not demonstrate signs of infection we can typically treat the nail with little to no pain by carefully trimming and beveling the edge of nail away from the skin which alleviates the pressure on the skin. In cases where the nail is severely painful or demonstrates evidence of infection, the toe may need to be numbed with an anesthetic and a portion of the nail is then more aggressively trimmed back to ensure there is no pressure on the adjacent skin. If a nail is infected, an oral antibiotic may be required to alleviate the infection and pain. Any redness combined with pain or especially drainage next to the toenail should be evaluated as quickly as possible to prevent the condition from worsening. Athlete’s foot: This is a fungal infection of the skin which we refer to clinically as tinea pedis. This condition occurs more in the adolescent population of kids because of hormonal changes in combination with playing sports that increases sweating in the body (particularly the feet). Moist, dark places (like stinky shoes) provide a great environment for fungus (which naturally occurs in our world) to populate and multiply and cause the skin to peel, become itchy and blister. When we treat athlete’s foot at our office, using a topical on the skin for 2-4 weeks typically clears the current infection. To prevent recurrence, products which reduce sweating as well as sprays for shoes are available to treat the environment that otherwise has potential to re-infect the skin. 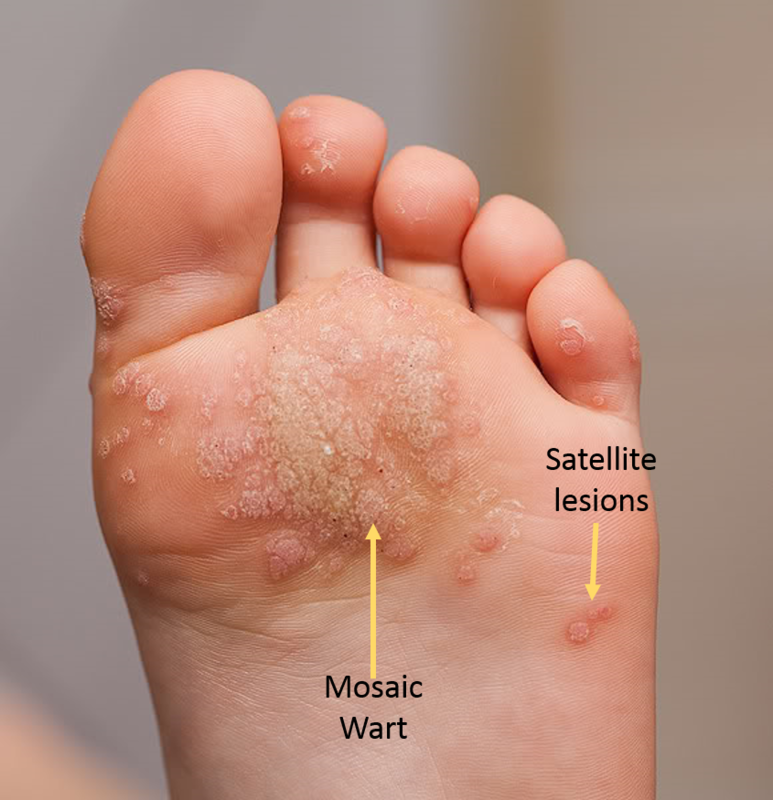 Warts: Plantar warts can be seen in kids as young as 5 or 6. It is caused by a virus in the body which is not curable. That being said, our office has a treatment which helps the body’s immune system to fight off the skin presentation of the virus which we call the wart. The treatments themselves are painless and effective – and we have even noted less recurrence of warts that with other more traditional treatments (ie. Freezing). There is some home care that is recommended which helps reduce the time until these resolve. All that being said, treating younger children for warts often has faster results because of some differences in our kids’ immune systems. Warts typically look like a dry, thicker patch of skin (almost like a dry callus) that in some cases demonstrates small brown/black dots throughout. Over the counter treatments may be effective, but if no improvement is seen with their use over 1-2 weeks, an evaluation and advanced treatment may be warranted. 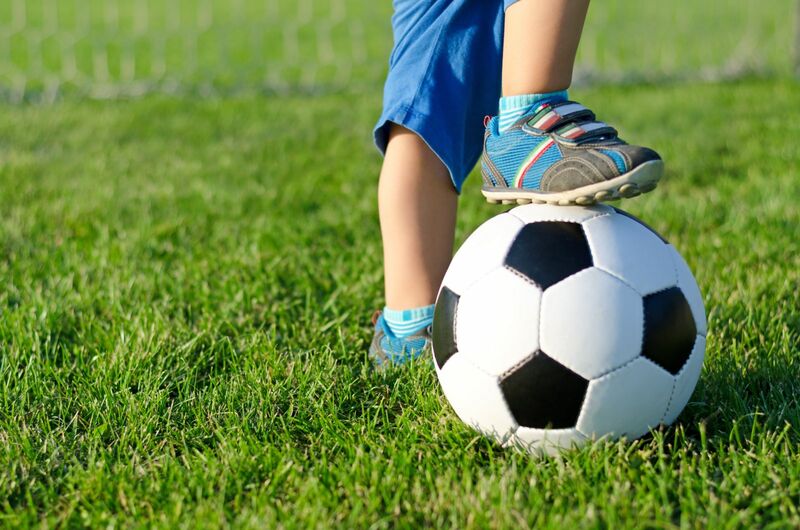 In our pediatric population injuries are typically due to ankle sprains or falls. As mentioned earlier, our kids won’t usually suffer from the same type of damage in their foot and ankle from a ‘sprain’ or fall as we do. Until they have reached skeletal maturity, kids have growth plates (or apophyses). These are small sections of cartilage that ossify (or turn into bone) as kids’ bodies mature. On x-rays they look like an irregular fracture line of sorts. These apophyses are the weakest point in the foot – so if your child twists their ankle or falls, they are much more likely to damage these growth plates than they are to injury their tendons (strains), ligaments (sprain) or bones (fracture). If these injuries go undiagnosed and/or untreated, the growth plate may not recover and heal and depending on the severity of the condition the growth plate may close prematurely. What does this mean? It can mean that the bone stops growing before it should and this can result in a shorter limb length. Growth plate fractures can be identified on x-ray if the growth plate has displaced (or moved out of normal position) or if the fracture extends above or below the growth plate and into the bone itself. There are some cases where no changes are seen on the x-rays but if the clinical history and exam raises suspicion that there has been compromise to the growth plate, we recommend immobilization to ensure the injury heals without complication. The most common non-traumatic musculoskeletal condition seen at our office has again to do with the growth plates. Heel pain in children is a condition we call Sever’s Disease. This is most commonly seen in our area around spring soccer, when the ground is still hard and kids are running on the fields. Kids can get tight through their achilles tendon and calf. The tight achilles tendon connects the calf muscle to the heel bone in the back of the foot and with increased activity and more jarring activities, the growth plate around the back of the heel experiences more movement than normal and can be come inflamed, causing pain. The age group most affected is around 9-12 years old when the growth plate has started to ossify (or heal) to the rest of the heel bone. This condition is often well managed with bracing, icing and stretching. Though there are some tougher cases which can require physical therapy or even more advanced immobilization. This is more often the case if the condition is not evaluated and treated close to the onset of pain. We often see kids with heel pain also have tenderness and pain to the achilles tendon itself. Because the tendon can become inflamed due to tightness (the same mechanical cause of pain in the growth plate), it is not uncommon or unexpected to see these two conditions at that same time. The treatment is generally the same – again because the cause is the same. Another commonly seen foot condition we see in our pediatric population is call pediatric flatfoot. When children are first born, their feet have a fat pad that lies in the area where the arch of the foot will later develop. For this reason, a foot which appears flat is not generally a worry prior to the age of 2. 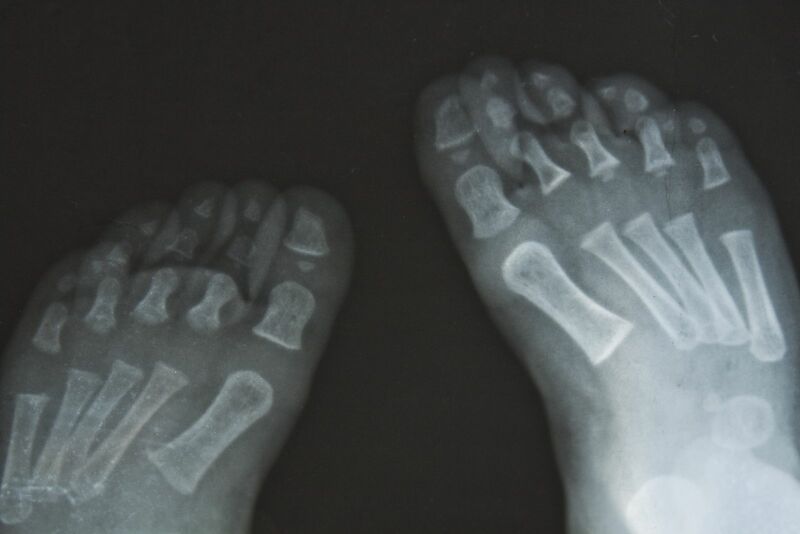 When our young kids are evaluated for flatfoot, between the ages of 2 and 5, we are going to be evaluated their heel position more than the actual arch in many cases. The angle at which the heel touches the ground has the most to do with whether a flat-appearing foot is truly flat versus still in the developmental process. As I eluded to earlier, kids will not typically complain that their feet hurt in this condition. Especially in the younger population, these kids instead tend to want to be carried and held more often. As they grow and begin physical activity, they are often less interested in athletic extra-curriculars and tend to not want to run. The reason for this is that when a child has pediatric flat foot, the joints in the middle of the foot are unstable and their muscles/tendons will be working overtime to compensate for this. The result is fatigued or tired feet and achy calves as well. For those kids who do experience and complain of pain, the pain is often on the inside aspect of the ankle and arch of the foot. Treatment, when indicated, will often begin with bracing to provide support that the foot greatly needs, which will acutely reduce inflammation and reduce the need for compensation. The more permanent solution is custom orthotics which children will continue to wear at least until skeletal maturity. These custom orthotics help to lift up the arch of the foot, realign the heel bone in its proper position and – if instituted earlier – has the potential to encourage the bones, joints, tendons and ligaments to develop in a more optimized position. Generally speaking, children are resilient. They are built to overcome falls, as this is part of growing. That being said, any condition that does inhibit their activities should be evaluated especially if it resulted due to a fall or injury, caused extreme swelling or bruising or if the pain and discomfort does not resolve within 1 week. Ingrown nails, warts and athlete’s foot also resolve sooner the sooner they are treated. Don’t wait to call! Let’s work together to get your little one back up to their old tricks.